Super Mario Bros 2, a platform game developed and published by Nintendo in 1988, is the sequel to Super Mario Bros. It is set in the dream-land known as Subcon. Mario's task is to free Subcon from Wart, the game's final boss. Koji Kondo (Punch-Out! !, Super Mario series, The Legend of Zelda series) composed its music. 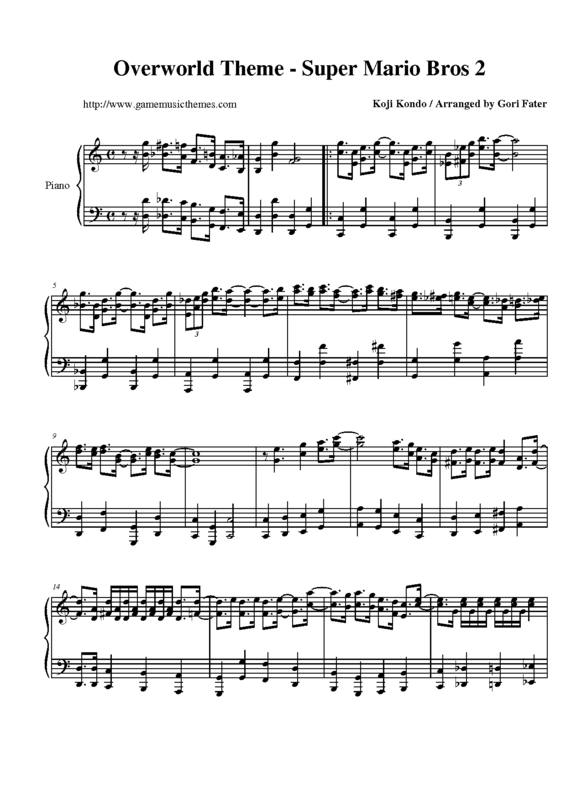 In this page you can download sheet music, music files and more for the musical themes of the Nintendo Entertainment System (NES) video game "Super Mario Bros 2". Click on the name of a theme if you want to visit its individual page, where you may find more information about it. If you are having problems downloading or opening the files, please visit this link: How to Use this Website.